Woodbridge Pointe community is sold out and is not in active development by builder. If you are interested in Woodbridge Pointe or similar new home communities, contact us today! Our agents are very familiar with new and newer construction in Virginia Beach, and can identify resale opportunities in Woodbridge Pointe, as well as builder inventory available in nearby or similar communities in Virginia Beach. To view 17 more pictures, interactive maps and the full, detailed description of the Woodbridge Pointe community, please Login. New homes in Woodbridge Pointe offer everything new construction properties should. Houses for sale in this Virginia Beach, VA, development are nicely appointed and cost less than visitors may expect. This development combines classic charm with the latest homebuilding designs. Centrally located in a convenient part of Hampton Roads, this home base allows service members easy commutes to NAS Oceana, the Coast Guard Finance Center and Dam Neck. Homeowners who work at the Virginia Beach Municipal Complex or Sentara Princess Anne Hospital will not have far to travel either. Check out these houses for sale and find they are not the average new homes. Choose from nearly 18 new construction models when customizing your next residence. Select the plan that’s right for you and your family by looking at the different layouts. Buyers with larger families may opt for the Maggie, which has four bedrooms and a bonus room or the Hillsborough that allows up to five bedrooms. Smaller family units may consider three bedroom models like the Chandler and the Charleston. There is a perfect model home for everyone at Woodbridge Pointe. New homes in Woodbridge Pointe are an excellent value. Each of the houses for sale here may include brick skirting, covered front porch, hardwood flooring, exterior stone accents, granite kitchen countertops, pendant lighting, recessed lighting, two-car garage, ceramic tile flooring, ceiling fans with lights, crown molding, deluxe kitchen cabinetry, undermount kitchen sink, tile backsplash, chair rail, stainless steel appliances, sodded yard complete with landscaping, kitchen island, architectural elements and much more. New construction properties don’t always come with so many stylish features so homebuyers can appreciate the attention to every detail. Before buying any of the houses for sale, buyers should get acclimated with the neighborhood and all it has to offer. The new construction in Woodbridge Pointe is located right in the mix of things in Virginia Beach. This area of Virginia offers buyers of these new homes all sorts of enjoyable activities. Sports fans can stay in the game at the nearby Charlestown Athletic Park. Golfers can enjoy challenging games at nearby Stumpy Lake Golf Course, Greenbrier Golf Course and Honey Bee Golf Course. Shop, dine and browse all around area Greenbrier retail centers and commercial properties. Builders: McQ Builders, Oceanside Building, J-Lynn Co. 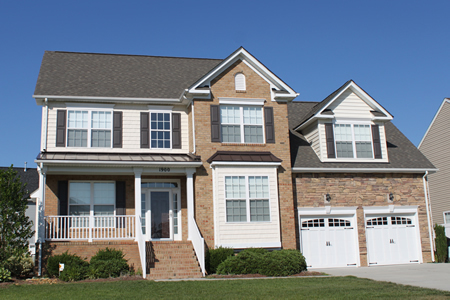 Send me more information about communities similar to Woodbridge Pointe. Our agents gladly offer FREE property tours of Woodbridge Pointe, Virginia Beach and homebuyer consultations to all serious buyers.